Oasis . . . Sanctuary . . . Retreat . . . Your backyard paradise is our passion! Water features transform an outdoor living space into a beautiful paradise where you can relax, unwind, and enjoy quality time with family and friends. Water features become the focal point of any garden with their engaging tunes and natural ability to attract a variety of birds and butterflies. Whether you tuck a Garden Fountain or Pondless® Waterfall near the entrance of your home or create a backyard habitat with an Ecosystem Pond and waterfall, you’ll find each day enhanced when you waterscape your landscape. Whether you have an expansive lawn or a small balcony, True Pump will help you choose a water feature to suit your lifestyle and budget. 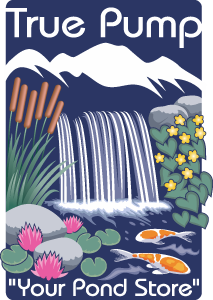 All the True Pump sales staff are pond owners and share your passion for water gardening! We have an extensive knowledge of ponds, water features, aquatic plants and fish and are here to help you complete your project right. True Pump was named Aquascape’s first distributor in 1996 and the primary focus of our business is ponds and water features for both the retail and wholesale markets. Sustainable waterscapes and landscapes that maximize conservation are our top priority. A well-designed water feature will add value to your home and give you a sense of pride in constructing a “green” feature. Water features improve the environment in a variety of ways – they offer additional habitat and a needed water source for wildlife, they produce a natural cooling effect in the landscape and also help with noise abatement. The use of high-efficiency pumps and LED lights reduces energy consumption. A properly constructed water feature minimizes evaporation and actually requires less water to operate than the same area planted with turf grass! To maximize water conservation the water feature can even be installed as part of a Rain Water Harvesting System. Put True Pump’s experience and passion to work for you today and you will understand why we are "Your Pond Store."